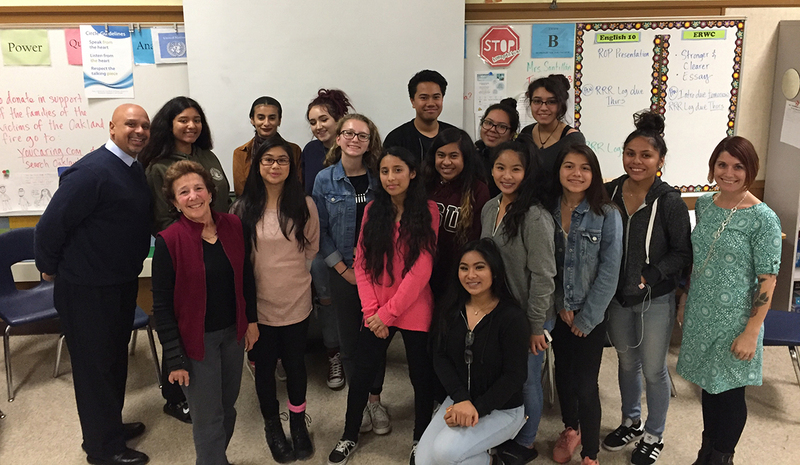 On Tuesday, December 13, I got to meet the wonderful Arroyo High School students who have committed to The World As It Could Is Within Reach Rite of Passage Class, which will begin on Tuesday, January 24th. At the far left is Arroyo Principal James Gray, and at far right is Jorja Santillan, the Arroyo teacher who will lead the class. Taking The World As It Could Be Is Within Reach to a new level, we are collaborating with Arroyo High School in San Lorenzo, CA to pilot the first after-school Rite of Passage class to guide youth to be engaged leaders contributing to their own health and vibrancy and to the health and vibrancy of their community as well. Arroyo teacher Jorja Santillan, a graduate of our Institute, will be the class leader, supported by members of our team and others from the REACH Ashland Youth Center. Jorja is now organizing the class of up to 16 students, from 9th to 11th grade, to begin meeting every Tuesday from January 24 to June 6, 2017. Given that Arroyo was part of our pilot 10 years ago, leading to the 2010 publishing our Curriculum & Resource Guide, and whose Future Leaders for Social Change Small Learning Community has been holding Town Halls on the UDHR every December since 2009, it is especially meaningful that the school will pilot our Rite of Passage program as part of a school system offering.